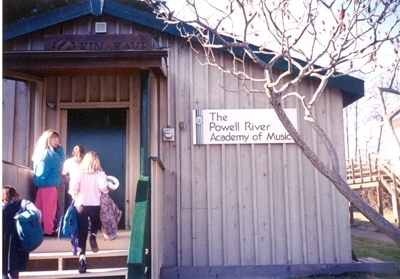 The Powell River Academy of Music grew out of a thriving community choral program for youth established in 1974. The program began with the Powell River Boy’s Choir formed in 1974 by Ken Peterson (conductor), Don James (accompanist) and Harold Carson. In 1975, Mr. James became conductor of the Powell River Boys Choir and in 1977 founded the Powell River Girl’s Choir, in 1980 the Powell River Youth Choir, in 1984 the Academy Singers, in 1995 the Academy Chamber Choir, and in 1999 Chor Pacifica Men’s Choir (now Chor Musica,) initially comprised of employees of the Pacifica Papers Company. These choirs soon gained national and international recognition through 26 international concert tours, TV and radio broadcasts in Canada, USA, Mexico, Hungary, England, Finland, Japan and through CBC and BBC amateur choir competitions. In January 1981, the executive committees of the first three choirs, inspired by the vision of Mr. James to create a community music school that would strengthen music education in Powell River and enhance the cultural life of its citizens, formed the Powell River Academy of Music. The Academy incorporated as a not-for-profit community music school in 1982. In its short history the Academy has grown to a performing arts school, encompassing music, dance, visual arts and theater with a student body of over 800 and a faculty and staff of 34. The Academy has not only grown in scope and size but also has established world renowned festivals, the International Choral Kathaumixw, the Symphony Orchestra Academy of the Pacific as well as the Annual Concert Series to enrich the lives of the students and the citizens of Powell River. In the early years classes were held at Oceanview School (1981-1983) and then at St. David’s Church Hall (1983-1986). During these years the Academy continued as a vocal school and was fortunate to acquire the services of Terry Sabine, first as a volunteer and later as a part time paid administrator. The vocal teachers included Don James, Susan Hoekstra and Brenda Yirka. In 1987 with the assistance of Mel Low and the Kinsman the Powell River Academy of Music acquired its first building, a grand piano and two upright pianos, stereo and office equipment and was then able to include keyboard instruction in the curriculum. This was truly a step forward for the Academy in fulfilling it's initial mission. The Academy program and reputation steadily grew. A summer music program, a concert series and our own bus to transport students added to the growth of the school. The faculty now numbered six and the office staff included Kay Matterson, secretary and Romi Low as registrar. In 1996 to accommodate its expanding enrollment, the Academy entered into a long-term lease with School District #47 to obtain our present facility, the former J.C. Hill School. The building committee under the leadership of Hector Beauchesne oversaw a major renovation of the school to accommodate the necessary teaching studios, rehearsal halls, ballet studios, offices and a state of the art recording studio. Since moving into its new space the Academy has expanded its program of study to include music, dance, drama, recording engineering and a college division. In 2004 the Academy purchased the facility from School District #47 (Powell River). Over the years the Academy choirs have continued to be international ambassadors for Powell River. They have performed in major halls and cathedrals and for important festivals and world events in Canada, USA, Mexico, Venezuela, Japan, Hawaii, Finland, Russia, Czech Republic, England, Wales, Denmark, Germany, Austria, Poland, Italy, France, Spain, and Hungary. Academy students have achieved provincial and national awards. In 1982 Music Director Don James seeing a need for an international choral festival in North America invited Dal Matterson to chair the initial festival. Under their skillful leadership, a committee was formed and the first International Choral Kathaumixw took place in 1984. Kathaumixw has now established a global presence and has grown to be one of the largest festivals of its kind. Kathaumixw has become known world-wide for it's for its international flavour, friendly musical atmosphere in a magnificent setting. In 1994, under the leadership of Peter Taylor the annual Vocal Jazz Summit was established to bring together high school and college ensembles along with world class jazz artists for a weekend of concerts and workshops. In the summer of 2000 the Academy with the District of Powell River launched the first Festival Powell River, an extravaganza of great international artists performing in all styles and genres. From 2004 to 2012 the Academy organized the Symphony Orchestra Academy of the Pacific with 88 players from 16 countries and faculty from major orchestras from Europe, Asia and the Americas and in 2013 the International Harp Academy. In addition to its educational programs and festivals the Academy organizes an annual Academy Concert Series featuring local and international artists. Jim Donnelly, President of the Academy from 1990-2013, further expanded the program by developing partnerships with School District #47, Vancouver Island University and the Laszlo Tamasik School of Dance. The Powell River Academy of Music is proud of its achievements and looks forward to its role in the enhancement of the arts in Powell River.